Louisiana, 1763. 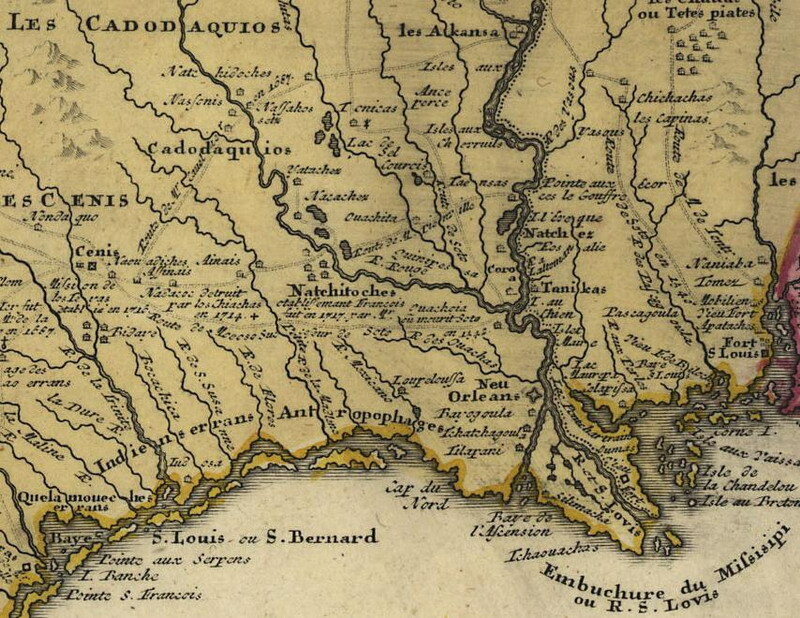 Portion of a French map of what later became the Louisiana Purchase. Map is from the Louisiana Digital Map Library, United States Digital Map Library, a USGenWeb Project, at http://www.usgwarchives.org/maps/louisiana/. Arkansas Post is at the very top center of the map where the Arkansas joins the Mississippi. The Arkansas Post, originally settled by French traders in 1686, near where the Arkansas River meets the Mississippi River, is considered to be the first permanent French settlement in the lower Mississippi River Valley. The area was home to the Quapaw tribe whose village was near the Post. This was a remote, primitive outpost, home to a small group of trappers, hunters and traders. Nearly a century later, in 1766, when Spain took over the area after the Seven Years War, there were fifty people living at the Post. One of the families living there at the time was the Jardelat family: Pierre, Marie and their three children. Arkansas Post in the 1700s was a hub of hunting and trading. The area was home to bear, buffalo, beaver, wolves and other animals whose pelts were highly prized. These were traded for highly valued items such as powder and ammunition as well as liquor. The Arkansas River was the primary route for all the trading taking place. It was remote and not easily accessible; to get from New Orleans to the Post up the Mississippi took thirty-five to forty days. In 1803 Arkansas Post, as part of the Louisiana Purchase, became part of the United States. By this time there were more Americans moving into the area. Arkansas Post became part of the Arkansas Territory. It is not known where Marie and her younger children went after Pierre died in 1798. Most likely Judit and Joseph, who were younger than thirteen in 1798, stayed with their mother but it is not known where they went. Joseph was in New Orleans for the 1804 census and he appears to have remained there. Alexis and Jean were still in the area of the Post in 1818. Louis was there until 1806, when he died. Arkansas became a territory in 1819 and Arkansas Post, the largest and most important town, became its capital. In 1821, the capital was moved to Little Rock which was becoming more populous. In 1929, Arkansas Post became a state park. In 1860 it became part of the National Park System, known as Arkansas Post National Memorial. There are museum exhibits, trails and a visitor center. "The Arkansas Post Story: Arkansas Post National Monument, by Roger E. Coleman. Arkansas Post National Memorial, Gillett, Arkansas. "The Arkansas River and the Development of Arkansas Post," by Roger E. Coleman, Arkansas Historic Preservation Program. Originally presented as a paper at Arkansas Post National Memorial on May 18, 1991 for the tenth annual Arkansas Heritage Week. Arkansas Post National Memorial Webpage: http://www.nps.gov/archive/arpo/history/coleman.htm. Abstract of Catholic Register of Arkansas (1764-1858), Core, Dorothy Jones, compiler and editor. DeWitt, Arkansas, Grand Prairie Historical Society, 1976, p.20.